We would like to take the time to welcome you back after what we hope was a restful half term break. The children have all come back into Nursery with a smile and lots to tell us about their week off. We know this half term will be just as busy as the last. This half term our topic is ‘colour’. This will also include activities about different festivals and celebrations and understanding different cultures. This week we are learning about Diwali. If any of our families celebrate Diwali and have anything the could lend us for the children to look at/experience we would be very grateful. We will be looking at Mendhi patterns, Diva lamps and even tasting Indian food. Please remember that from this week our Nursery gate will be closed for morning Nursery children. Any parents dropping children off in the morning will need to walk with their child to the main gate (gate 1) and walk through the playgrounds to get to the Nursery entrance. The Nursery gate will be open as usual for collection at lunchtime. If your child is unwell and cannot attend Nursery you must phone in before their session starts so we can note on the register why your child is off. Please call 01708 330704 to speak directly to Nursery staff. You must phone in everyday that your child is unable to attend. If your child is absent for a whole week you will need to ring every morning during that week. Due to the limited space in our cloakroom we ask that older children that are with their parents collecting Nursery children wait outside the main Nursery. This gives parents room to enter and exit and makes home time less chaotic for the younger children. Do you love new books as much as us? 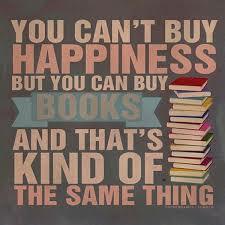 If you do, then come and visit the Book Fair! from 3.15pm until 4pm each evening. Come and see all the lovely new books - there's something for everyone! We would like to welcome you back and hope you enjoyed the lovely Autumnal weather and feel well rested. Our theme this half term is festivals, celebrations and patterns. This week our topic work will be based around the theme of Diwali. Diwali is the five-day festival of lights and is traditionally celebrated by Hindus and Sikhs. It is one of the most significant festivals in the Indian culture. The word Diwali means row of lights. It is one of the requirements of the Early Years curriculum that children are aware that different people have different beliefs and the children are always excited to learn about celebrations. As part of our week we will be making diva lamps, looking at and creating Rangoli patterns and tasting a range of Indian style food such as samosas, bhajis, rice and poppadoms. If for any reason you would rather your child did not try this food, please let class staff know. Shows understanding of prepositions such as 'under', 'on top', 'behind' by carrying out a action or selecting correct picture. Choices are from Week 1 of the menu. Thank you once again for your support in helping at home with your child`s reading. Some people are hearing their child every night and when their child comes to read they are confident and happy to talk about their book. It really is an enormous benefit to each child to have this support so please try and spend just five minutes every day in helping them. Then please remember to sign those reading diaries every time you read with your child. Barbados Class have the most children reading three or more times at home so let`s see if St Lucia or Jamaica can beat them this week. We will of course be continuing with our phonics programme Read, Write Inc. We will also be sending home some phonics practise sheets for you to work on with your children. These are for your own use and don`t need to be sent back to school. Please continue to look out for messages and pictures on the Mead Primary School face book page and the Mead Primary School website. Please remember to speak with school staff if there is anything you are unsure of or you have any concerns. What is the Quiz Club? 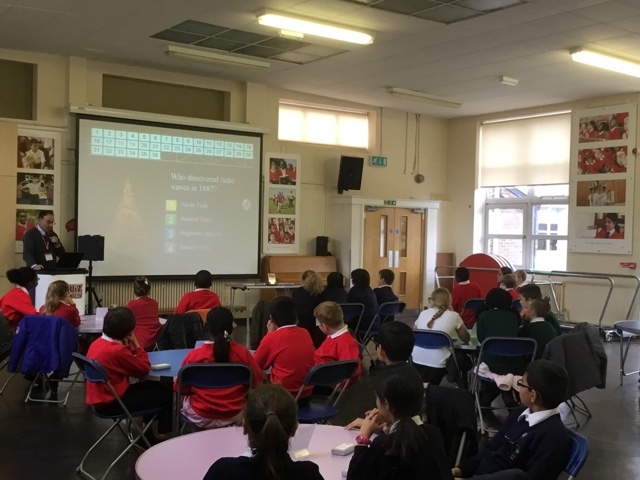 Quiz Club is a unique and exciting approach to motivating, inspiring, encouraging and rewarding children in their quest for knowledge and providing them with the opportunity to celebrate their achievements as part of a high profile, national competition. More than 400,000 children take part in the Championships annually, making them the largest inter-school competitions in the UK! We believe that the Championships reinforce team work, boost confidence, encourage strategic thinking and light the fire for knowledge. There are two national championships; The National Keystage 2 General Knowledge Championship, The National Years 5 & 6 Science Championship. Look out for updates about the General Knowledge event which takes place later this academic year. We had to revise a lot in school to prepare for the test. The questions were really challenging and I learnt a lot. Now I know all about the periodic table! I didn't realise that you had to learn about equations for reactions. On Wednesday 12th October 2016, a group of children from our school had the opportunity to experience live music making in one of the world’s most famous concert halls -The Royal Albert Hall. Children were absolutely overwhelmed by dynamic and vibrant performances presented by young musicians. When asked about their favourite acts, they undisputedly voted for The City Academy Hackney Choir which sang ‘Stand by me’ and The Turtles Steel Band which played on pans, containers and drums. ‘I enjoyed listening to the County Youth Orchestra but choir was the best’- George. ‘That was the first concert I have ever been to’- Amelia. ‘The girl from the choir had an incredible voice’- Cody. We hope that this concert will inspire the children and motivate them to become the next generation of music-makers. 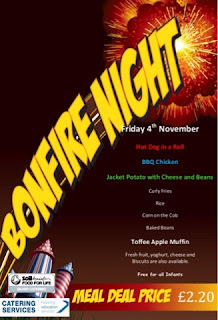 Don't forget to come along for the special Bonfire night lunch that Janet and her team will be cooking up on Friday 4th November! Just prior to the half term we saw the completion of our mud kitchen for EYFS & KS1. 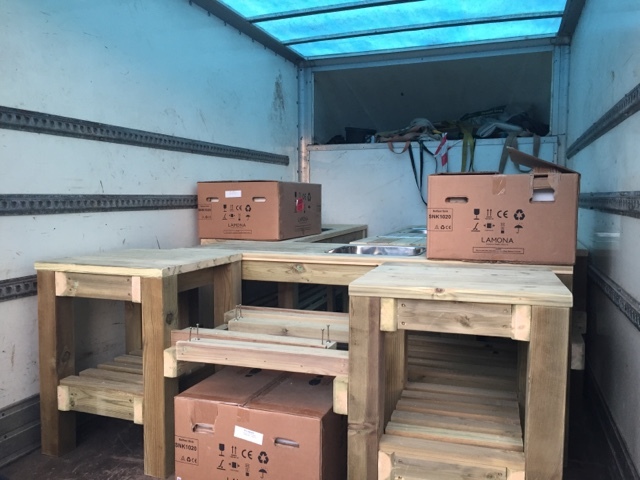 This is a significant increase on what the children had available before. 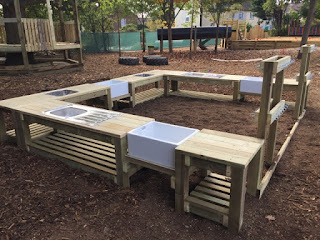 Once the water play feature is in there will be easy access to water to help them create their pies and potions. We have designed the kitchen so that the pupils are able to talk across the work surface and collaborate more easily. 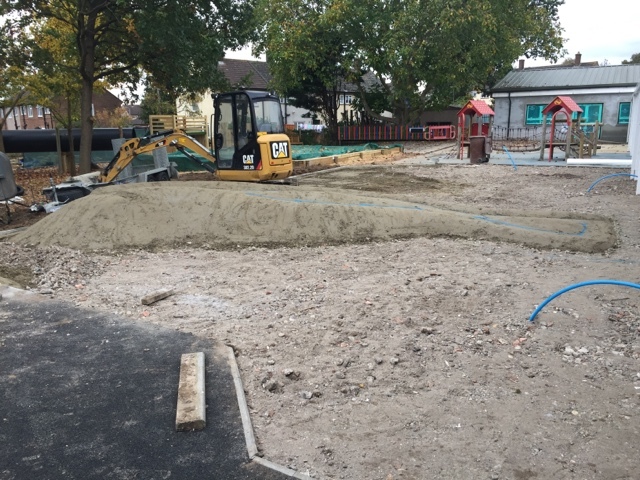 We are now very close to seeing the completion of a music area for the pupils in our EYFS. 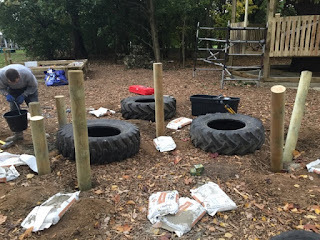 All of the poles are in and the equipment is due to follow shortly. 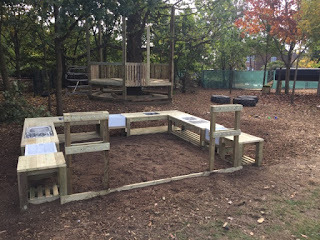 This will be another great collaborative space for the children to share and enjoy. 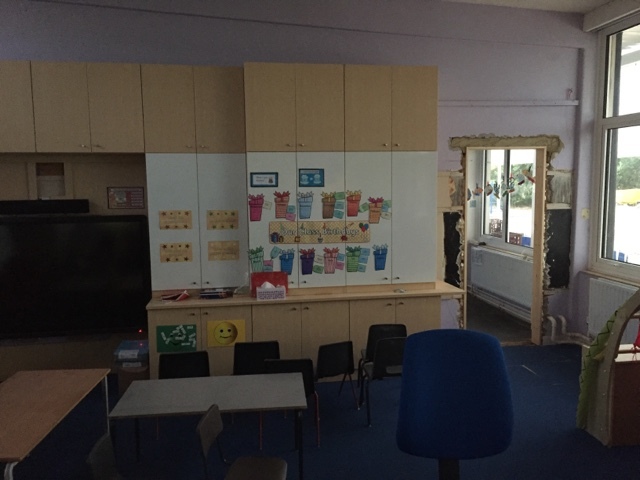 By the time the children come back to Nursery on Monday, their environment will have seen a further transformation. 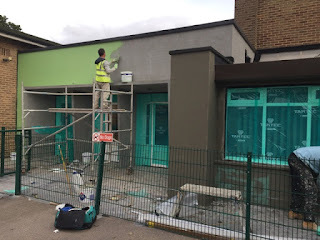 Now that all the windows and doors have been updated, we have been able to get the brick work rendered. 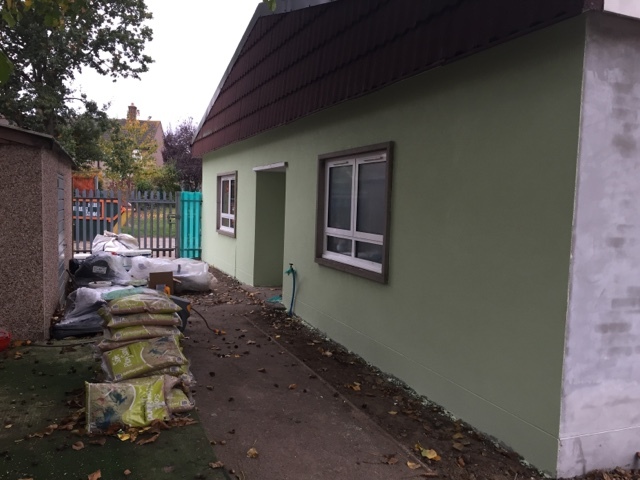 This is another step towards completing rejuvenating the EYFS outdoor area to ensure that our pupils have one of the best environments in East London. 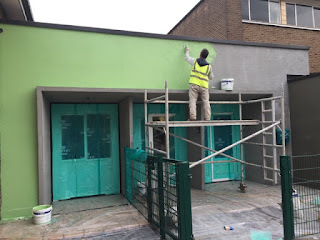 Thank you to Teampol who have carried out the works and given the building such a bright finish. 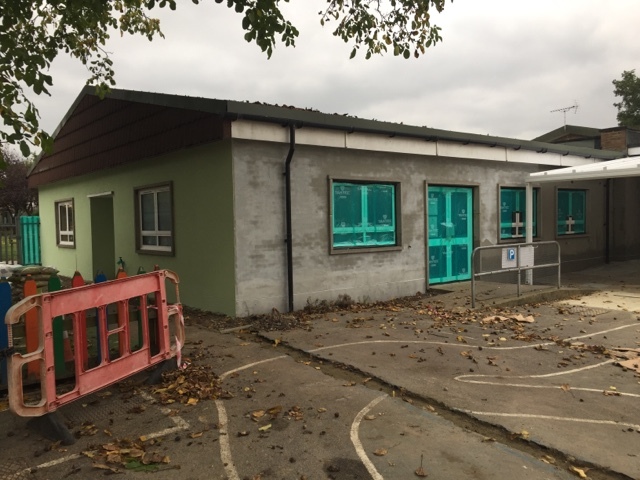 Going forward the plan is to carry this on to the front elevation of the building and incorporate the Nursery entrance and KS1 Hall. 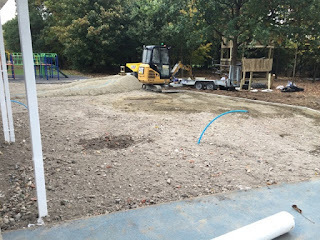 Kompan have now started their installation of the water play feature for the EYFS & KS1. Initially this has involved preparing the base and creating the foundation for our own cobble stream system. There will be multiple large scale pumps through which the children can access water; mathematical markings to help their play; water tables and troughs for investigations and a large water wall which they can manipulate. We expect the feature to be finished by the middle of November and we know it is going to be a huge hit with the children. The Governing Board will have invested over £50,000 to bring this learning resource to life! Once it is ready we will be giving parents a chance to come and see it for themselves. 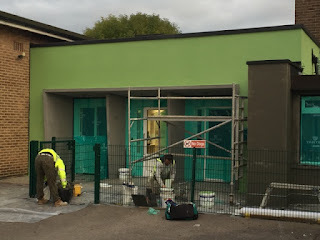 Along the KS2 downstairs corridor we have now started the process of replacing and updating the doors. Prior to this they were the original doors from over 30 years ago. 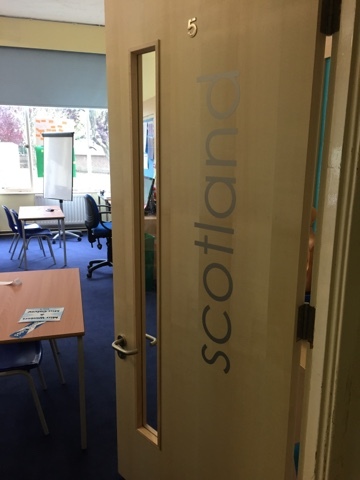 The visibility into the classroom was limited, the doors looked tired and old and we wanted to ensure that pupils have a modern, fresh environment in which to work. 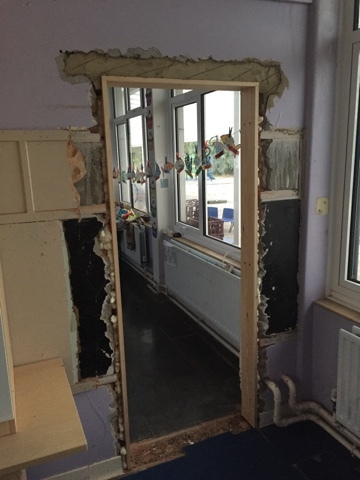 Thank you to Value Grade, who carried out the work and have given the corridor a real lift! 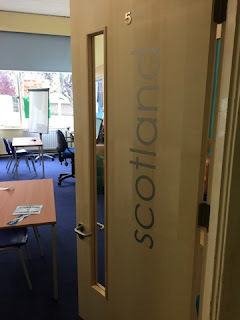 Each door has also had signage added, so that classes are clearly and consistently labelled. This half term has seen the start to the rendering work that will give Mead Primary a much needed facelift and more modern appearance. To begin with we have had the main entrance rendered. 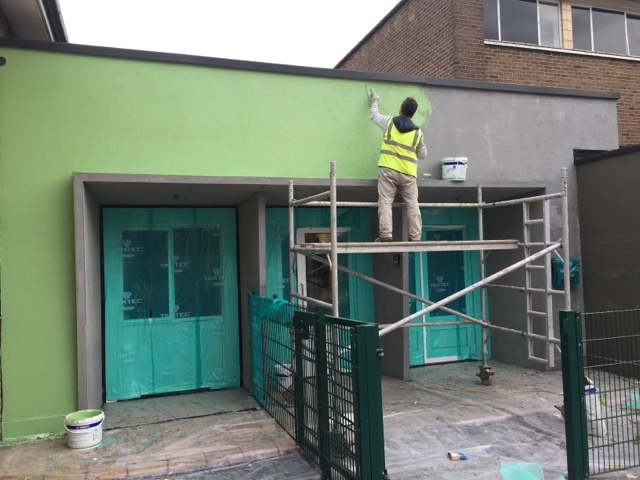 Moving forward the rest of the school will also see this mixed use of brick and render to freshen the appearance of the building and give it a more modern feel. 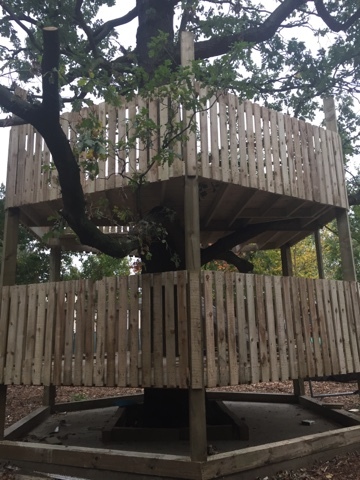 We believe that the quality of the environment that welcomes the children every day makes a huge difference to the quality of education they get. Tired, run down, deteriorating spaces are not in keeping with the inspirational this we wish to embed. We are very excited to hear feedback from parents and pupils when you get to see it up close on Monday! 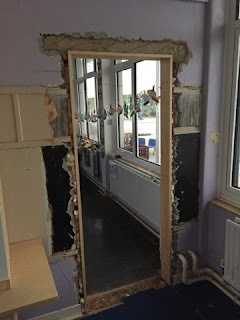 Over the half term holiday we had a doorway created so that all of our EYFS classes are now linked together internally. This will make it much easier for pupils to flow between the classrooms and share resources/areas that have been laid out by the staff. Prior to this, one of the Reception classes was cut off from the others and we wanted to ensure that there was equal provision with free flow both indoors and out. All of our staff in the EYFS share in the observations of the children and contributing towards their assessments. This is an important way of helping them to ensure that this happens regularly. Our new tree house is almost at completion. 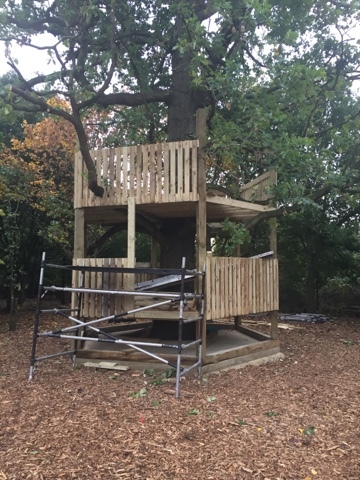 Over the half term we have seen the second level added and we now just need the staircases and ladders to finish it off! We expect this to be a fantastic imaginative play space for the children, which really puts them in amongst the branches. Our Learning Federation Governing Board will be delighted to welcome parents and carers from both schools to Broadford Primary on Tuesday 1st November. We will update you on the Learning Federation and how things are going. Mr Drakes will report on building works at the two sites and future plans for the Federation. You will also learn about the exciting progress in your children's education. In addition we would be pleased to hear your views and answer any questions you may have. Every attending adult will be given a raffle ticket: one for each child. 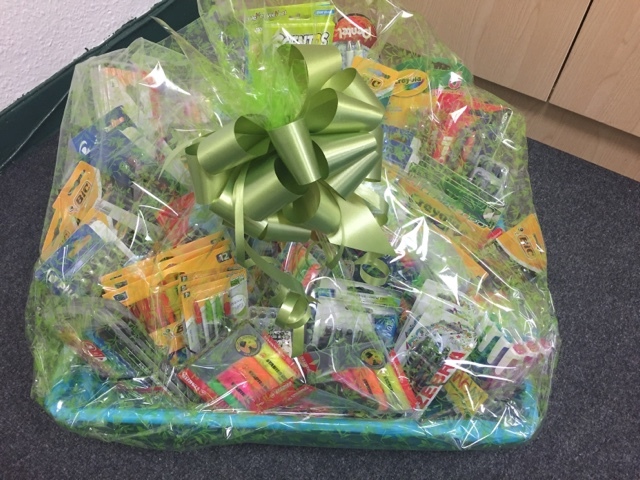 If you have three children in the school (Broadford or Mead) then you will get three raffle tickets. At the end of the session there will be a draw. The winning raffle ticket will have the hamper below donated to that child's class! Thank you very much indeed to Paperchase who donated the items in the hamper! 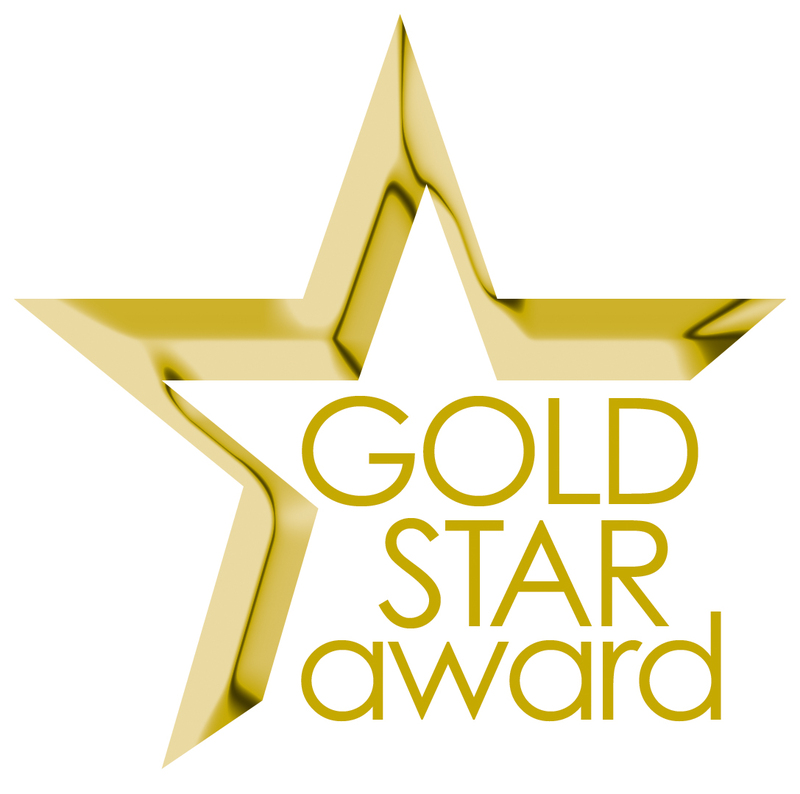 Congratulations to our pupils from both Broadford and Mead Primary School who have received gold sustainable travel active responsible safe (STAR) status for having completed 40 different travel activities over a three year period. The pupils were also able to demonstrate a six per cent shift away from car use with at least 90pc of children travelling by non-car modes. 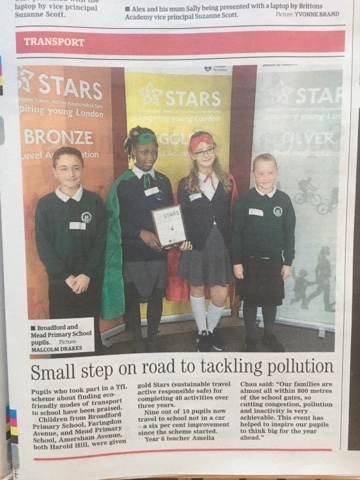 Pupils attended a seminar at Camden Town Hall on Thursday, October, 13 to receive their award. Environmental activities included, walk to school days, walking and cycling competitions. TfL are asking pupils to design a card to show how they think Father Christmas or Perry the TfL penguin should travel sustainably during the holidays. They can think about how would Father Christmas deliver presents if his sleigh breaks down and how will Perry do this Christmas shopping in London? 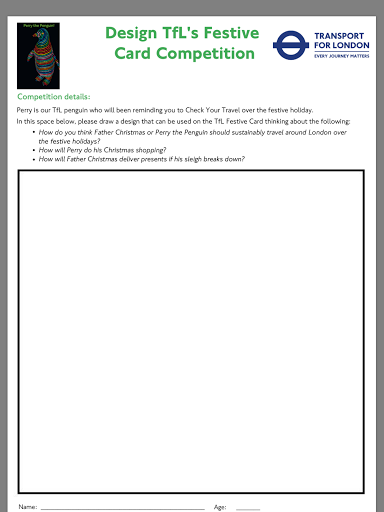 The winners will have their designs made into physical and/or digital greeting cards which will be sent to select TfL customers in December of this year. There will also be an exclusive prize, which will be announced before the competition deadline after half term. The deadline is Wednesday 2nd November, so it’s a great activity to complete during the half term break. If a winner is selected from our borough, digital and/or physical copies of the cards will also be available for your own use. Ronnie Spicer-London, Vansh Patel, Anastasia Munteanu, Ema Navickaite, Nicole Nykante, Ellie-Mae Rigg, Wajeeha Hussain, Emilis Juodelis, Lennie Hands, Lily-May Dedross, Teddy Button, Jessica Iancu, Liam Hattersley, Brooke Gray, Jamell Halley, Rubie-Mae Edwards, Sean Rider, Jack Webb, Abbie Harding & Logan Dunn. Look out for examples of their work on the blog! Year 4 Learning Challenge - Why are animals in the rainforest becoming endangered? Year 4 Rainforest topic- Why are animals in the rainforest becoming endangered? Our new geography topic after half term is going to be to investigate Rainforests. You can pick one of the topics below to do some pre-learning . Write 5 important questions that you would like to know about rainforests. Research about an endangered animal. Make a poster about what we can do to help, or prepare a short presentation for the class about this important issue. Research where in the world the main rainforests are located. Look at a map or globe to find them. Can you name the 5 oceans and 7 continents of the world? You could draw a map to show where they are located, and include a key to show what symbols on your map represent. Find a Youtube video about the rainforests and make some notes on what you have learnt. You could write a non-chronological report about the rainforest. The Great Kapok Tree: A Tale of the Amazon Rain Forest. 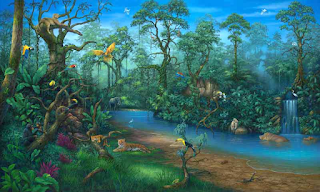 Try to find poems, fiction and non-fiction books about the rainforest. You can tell the class what you found out by reading them. Sporty fun for Half term! Lots of family fun for the holidays! Pond Digging for Pond Dipping! STARS Accreditation - Gold Award! Thumbs Up in Crime Lab! Time detectives investigate Roman Ruins!